I just do not know why I have not made it a habit going into Big Lots or the .99 Cent store every week to look for odd Japanese toys at blow out prices. Both are less than a five-minute drive from my house yet I always forget that historically I have always found great Japanese toys at blow out prices at such establishments. If you remember the late 1980’s when many toys were being cleared out at places like Sears’ Surplus and Pick N’ Save, these discount stores were the places to go to purchase the last breath of all the great toys from the early 1980’s. I remember going into a Pick N Save in the late 1980’s and seeing HUNDREDS of Matchbox Voltron I and Voltron II stacked across the risers at the blowout price of $25.00 each. What the heck ever happened to all those mint boxed Voltrons?! It just boggles the mind! 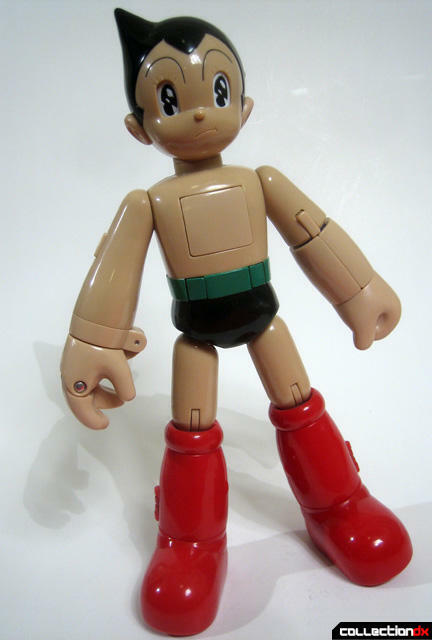 Flash-forward to 2006, I was in Big Lots picking up odds and ends and supplies for my film and I saw a small Astro Boy action figure for $2.99. 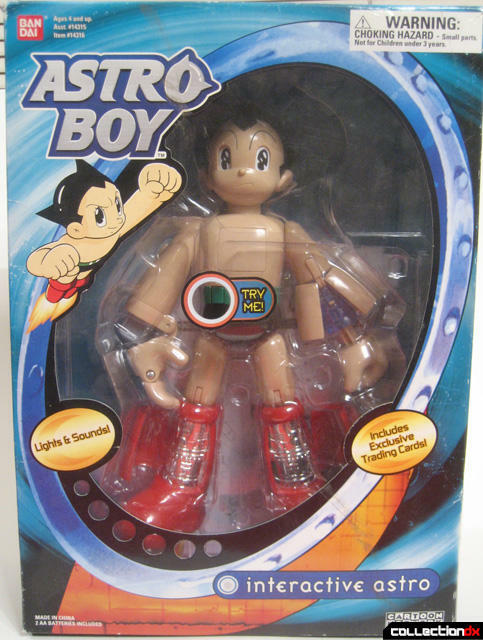 “Hey, it’s Astro Boy for a few bucks.” Thought nothing of it and tossed it into the cart. Thank God for suggestive sales as when I got to the checkout the salesperson was wondering why I wasn’t going to purchase “The large one? ” “The large one? Could you show me where it’s at?” Sure enough on a different aisle was a boxed large scale 13 inch Astro Boy for the buy me price of $7.99! There are some toys that if you are a Japanese’s toy collector you must own at least one example in your collection out of respect even if you do not particularly collect the series. This list includes a Valkyrie, a Mazinger, a Doraemon, a Voltron, a Godzilla, a RX-78 Gundam, and a Totoro. 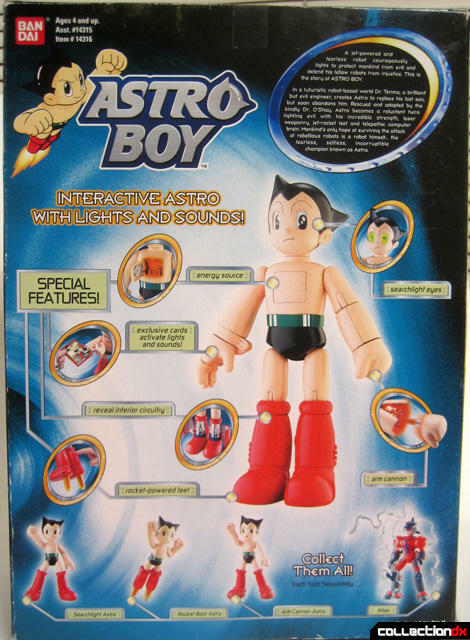 One toy I believe that should be on that list is an Astro Boy. 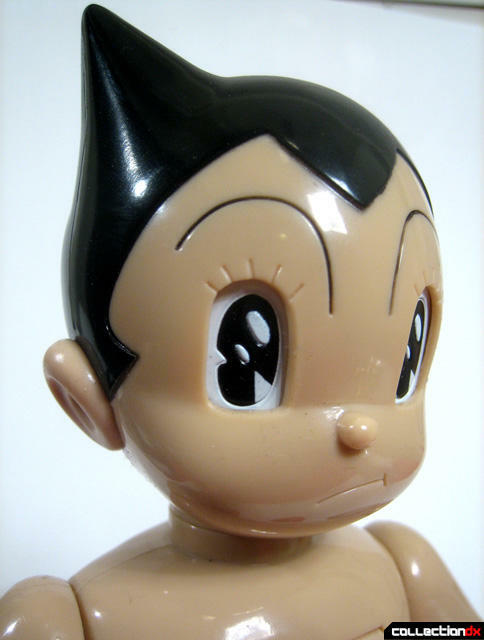 Osamu Tezuka’s Astro Boy is a cornerstone of the entire anime racket and his classic look and art design is one of the most recognizable of all anime characters. 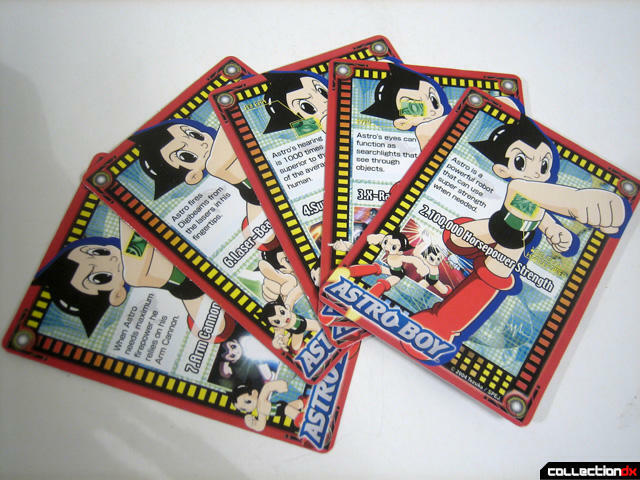 That is what so great about this Astro Boy. 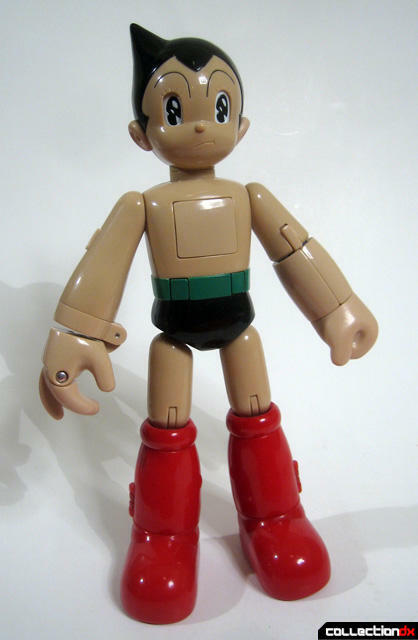 Bandai seems to have captured what is so great about this Astro Boy and more. It is one of the most active toys I have bought in a long time with many great features and gimmicks which leads it to feel that is was released in the 1970’s or early 1980’s. 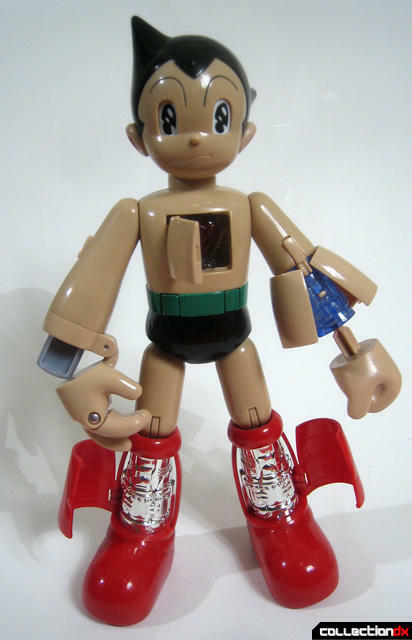 The boxed Astro Boy is sandwiched between two sheets of vacuform plastic with many of his features exposed. 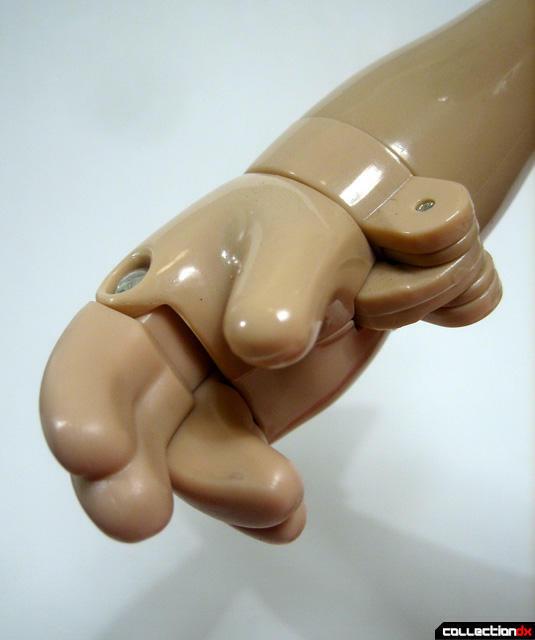 Because each limb has some sort of feature, it is best to discuss one limb at a time. Let us start with his head. The sculpt of his head and hair is great and captures that whimsical 1950’s hairstyle perfectly. When one twists the head another set of hidden eyes are exposed and light up. The spring-loaded head snaps back into place when you are through. His concerned look on his face looks like it could have been better, but on the whole looks fine. The chest area has two buttons on the belt and makes sound effects. 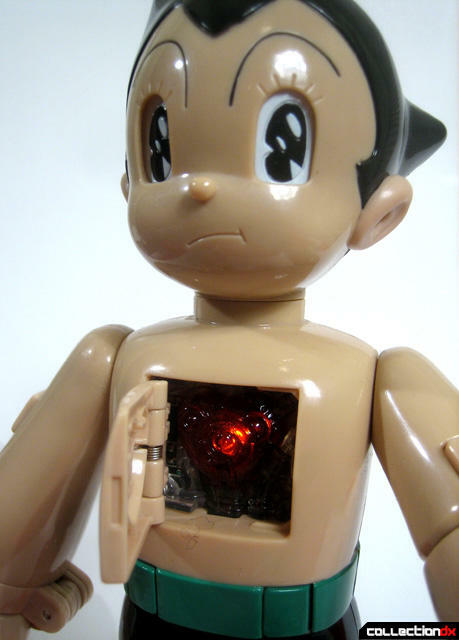 If you push the right button it snaps open the chest to expose the light up heart with sound FX. 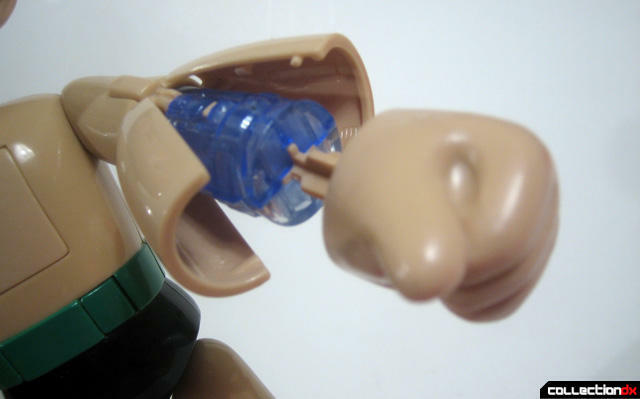 Now if you hold both belt buttons down and twist the head at the same time the toys makes a unique power up sound FX and lights up the heart in a different pulse sound. The right arm clicks open and the wrist opens the scanner. If you slide one of the five cards that are included it “scans” the card and makes another sound FX. In classic 70’s Chogokin style, the right fist shoots off and opens up the inner wrist mechanics when you push the button on the arm. 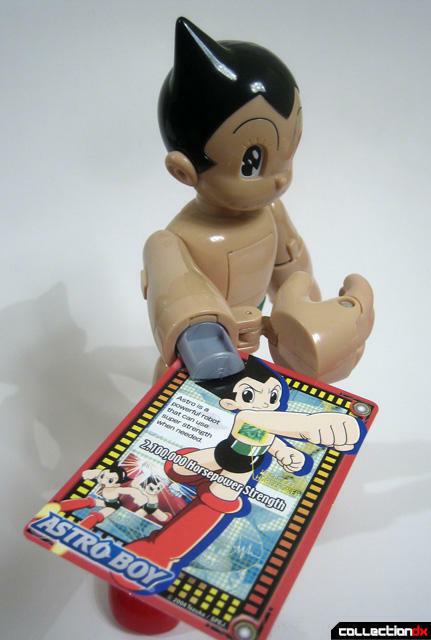 There is nothing cooler than shooting fists on a Japanese toy and this Astro Boy is one of the best current examples I have seen in a long time. Both legs open up and expose the inner mechanics of the jet engine. 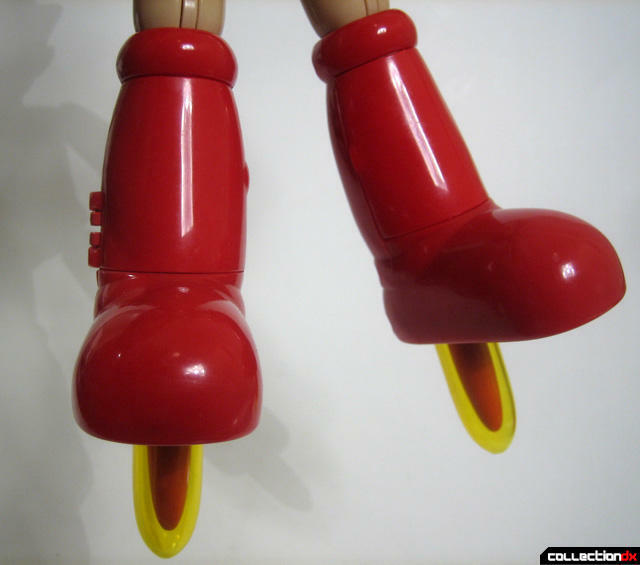 Another great feature that Bandai just nailed is when you engage the buttons on the back of the legs spring loaded jet exhaust and flames appear from the bottom of the feet. 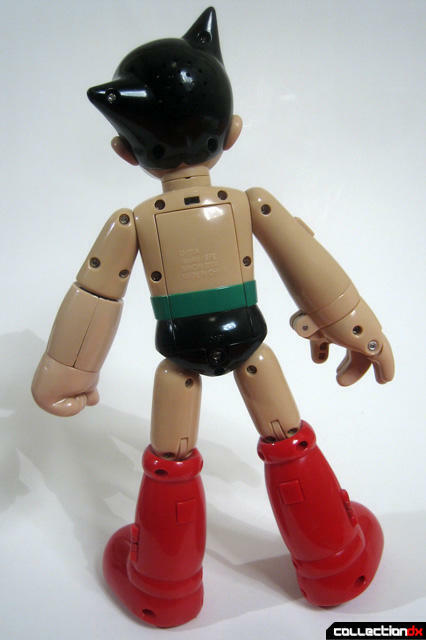 It just captures the spirit of Astro Boy so perfect and the clear parts look great and well thought out. Beautiful job Bandai! 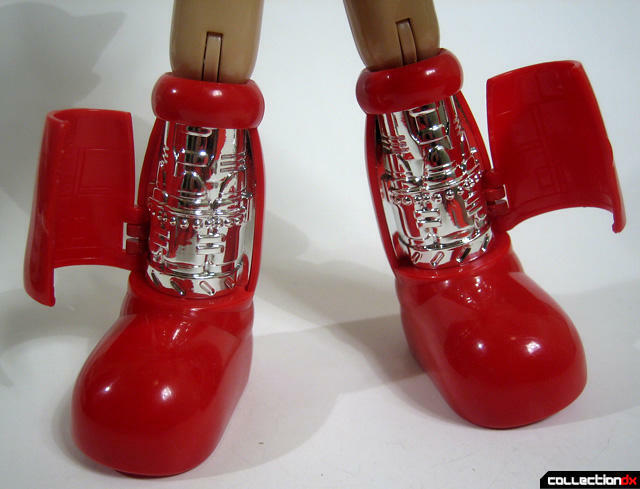 I only wish one could take the toes off for that foot-less Astro Boy jet look I like so much. 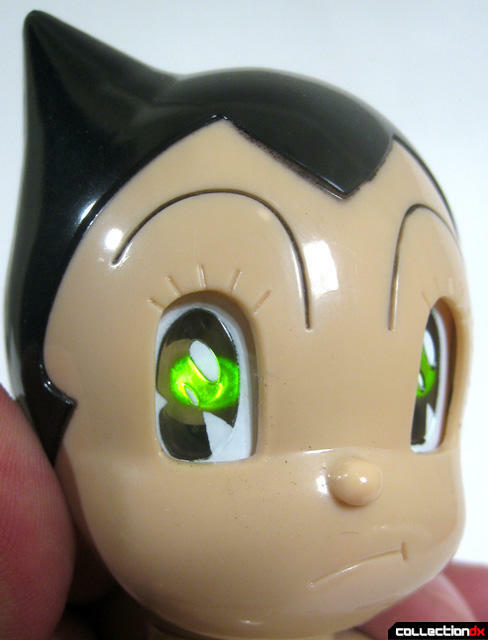 Snap all the gimmicks close and you have one of the nicest looking Astro Boy toy on the market without having to break the bank. I do not know how much these were selling when they were released but spending $30.00-$40.00 on one of these today and you would definitely not feel let down or that you overpaid. The plastic is solid, the articulation is within reason and the charming likeness of the character is captured perfectly. And most importantly it is BIG. 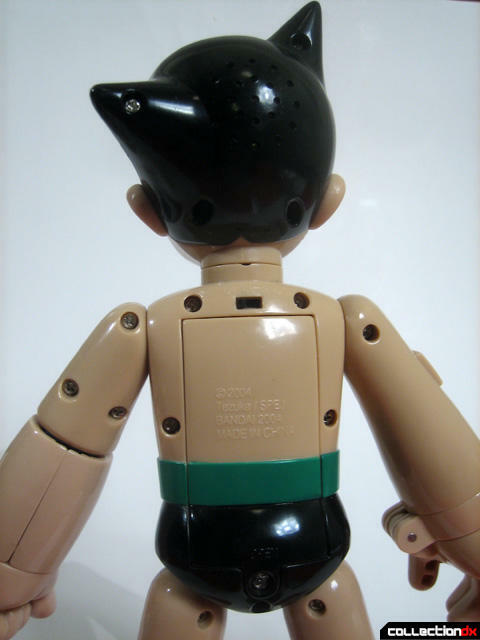 In fact the only way Bandai could have improved on this figure is if they made it out of metal and put an “Astro Boy” stencil in Japanese across the belt or chest. It is that well done. Astro Boy looks perfectly at home with all your other Chogokins and Valkyries in the display case and is a beautiful link to the past of the early days of anime. ©2009 article & photos Leonardo Flores and Collection DX. Nice find.Love all the gimmicks on that.Only thing I ever find at my 99cent store is scented candles. Only thing I ever find at my 99cent store is broken dreams. And mediocrity. ...and lots and lots of Super Sentai knock-offs!